Rumour: Is This PlayStation 4 New Controller? Days out from Sony’s February 20th reveal, an image has surfaced of what is claimed to be the next PlayStation console’s newest controller. 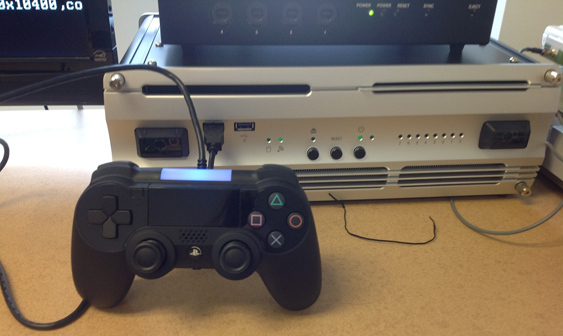 The imagine of the prototype controller originated on Destructoid and has since been confirmed by Kotaku as their sources have said the photo to be genuine. EDGE previously reported on the redesigned controller and the images do appear to be inline with what has been speculated so far. Not a drastic departure from the current DualShock 3 design, the controller has nevertheless received updates in the cosmetic and functionality department, most notably the introduction of a touchpad which replaces the select, start and PS button. There are also reports of a new Share button for users to save and load screenshots along with videos online. Although this is only a prototype photo and all rumours at the moment, signs are pointing strongly to this being the real deal. As always, take it with a grain of salt and make your own judgments. Full details should become available on February 20th with industry experts tipping a Sony console review in under a week’s time.